Many weeks have gone by since containers and hanging pots were planted. At the beginning, watering was easy; plants were small with a limited root system so the container or pot held lots of available water for good growth. Fast-forward to now, and the water management has changed as the plants developed. The hanging pots are now full, with lots of bloom and cascading vines, the containers that have vegetables in them are flowering and producing for us, and those container flowers are maturing for the summer too! For best bloom show and performance, the big deal is never to let the plants wilt. Yes, they recover but a future cost of less produce or less ornamental flowers. If left to wilt, a portion of the roots are lost and often with that there is the loss of some foliage and early flower death. Plants recover, but energy will be directed to rebuilding roots instead of blooms. Before hanging pots wilt, the pots get lighter (remember water weighs about 8 pounds per gallon). Use your index finger and eyes as a moisture monitor; the soil mix will feel dry, and the soil may pull away from the edge of the pot. The same goes for the larger containers, though not many gardeners actually pick up those large containers to see how light they are. The best way for plants to receive water is directly to their roots, whether using a watering can or a garden hose with a water breaker. This has an added benefit of keeping leaf surfaces dry to prevent diseases. This is especially important on the vegetables, like tomatoes. Watering early in the morning will ensure enough available water during the hotter parts of the day. However, if returning home at the end of the day and plants have wilted, water immediately. Do not wait for the next morning; plants will take up water during the night. If you wait until morning, wilted plants will struggle to recover all day long in the sun. 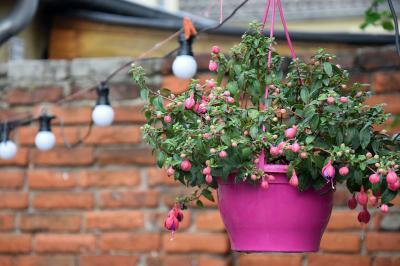 Big plants in small containers or hanging pots often will need to be watered twice a day. Those larger containers have more soil mix allowing a longer buffer between watering. Other signs of uneven watering with container vegetables will be uneven growth of fruits. Cucumbers will have that fat/skinny look, bean pods will develop with an uneven appearance and tomato fruit skin will crack and split. Not all is lost when it comes to keeping pots and containers evenly moist. Many potting mixes now contain water-retaining gels that absorb lots of water and later give it up as the soils dry. Potting mixes also are designed to drain well to avoid getting waterlogged, which damages roots and can cause crown rots killing the plants. When you do water, make sure there is enough water to drain out the bottom. For hanging plants that is easy, less obvious for container plants. A note of caution here, when the soil mix dries and pulls away from the sides, water will run down the edge of the pot and drains away quickly. A follow-up watering often is needed to be sure the soil mix rehydrates and swells back out to the edges.